Kateryna Lagno emerged Women’s World Rapid Champion by edging Alexandra Kosteniuk on tie-break after both players finished on 10,5/15 points. Lagno claimed the gold medal thanks to the victory in direct encounter. Kosteniuk gets the silver, however the money prizes will be equally split. Lagno was also World Blitz Champion in 2010. As many as five players entered the final round with even scores, setting the stage for the thrilling finale. Olga Girya, Antoaneta Stefanova and Anna Muzychuk shared the third place with 10,0 points, but Girya won the bronze medal on second tie-break criteria – greatest number of wins. 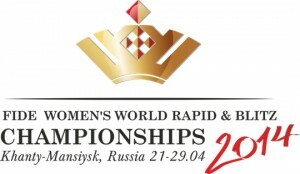 The FIDE Women World Rapid Championship 2014 was held from 23rd to 25th April at the Ugra Chess Academy in Khanty-Mansiysk. In the 11th round Alexandra Kosteniuk scored a swift victory against Inna Gaponenko to again single out on the top with 8,0 points. Defending champion Antoaneta Stefanova looked certain to join the Russian, but she dropped the big advantage and Anna Muzychuk saved a draw. Kateryna Lagno, also a co-leader after day two, narrowly escaped against Marina Guseva to make a draw with perpetual check. Tatiana Kosintseva and Irina Krush won nice games to catch the group on the shared third place. In round 12 Kosteniuk continued to demolish the opposition, her victim this time being Guseva. Lagno kept the pace by crushing Zhao Xue and Stefanova also remained close after taking advantage of Krush’s blunder. Top six games ended with decisive results – Anna Muzychuk, Kosintseva and Girya were also victorious. In the 13th round Kosteniuk was on the brink of defeat but she found a magical resource to reach a stalemate against Zhao Xue. This proved to be a precious half a point as both followers, Stefanova and Lagno, suffered setback by losing their games. In another nerve-wracking affair Stefanova pushed for a win, but Valentina Gunina turned the table with a checkmating net. As it happened, Kosteniuk extended the lead to full point. Krush failed to convert two extra pawns in the queens’ endgame against Anna Muzychuk, allowing the Slovenian to join the large group on the shared second place, which also included Lagno, Stefanova, Kosintseva and Girya. But already in the next 14th round Kosteniuk lost to Gunina after blundering a tactical shot in an equal position. The fatigue clearly kicked in for most of the participants. Stefanova simply handed a pawn to Alina Kashlinskaya early in the opening. But the Bulgarian fought her way back into the game and then proceeded to crush the opponent with a devastating attack. Anna Muzychuk steamrolled Guseva, while Kosinsteva won in a miniature after Krush mixed up the lines in the French defence. Lagno went for an all-out attack against Anna Ushenina and this risky strategy paid off as she finally broke through the black defences. Heading into the final round five players were tied on first place – Kosteniuk, Stefanova, Lagno, Kosintseva and Muzychuk. In round 15 the first result from the top boards was the shocking loss of Gunina who allowed Lagno to deliver checkmate in one. Moments later Kosteniuk defeated Pia Cramling to join Lagno on the shared first place with 10,5/15 points each. Stefanova tried everything to convert R+3P vs R+2P into a full point, but Bela Khotenashvili was calm enough to hold a draw. Gaponenko confidently held Anna Muzychuk to a draw, while Nana Dzagnidze knocked Kosintseva out of the medal contention. Olga Girya pulled a worthy win against Harika Dronavalli, eventually claiming the bronze medal on best tie-break. 34 female players from 13 countries competed for the title and prize fund of $50,000. 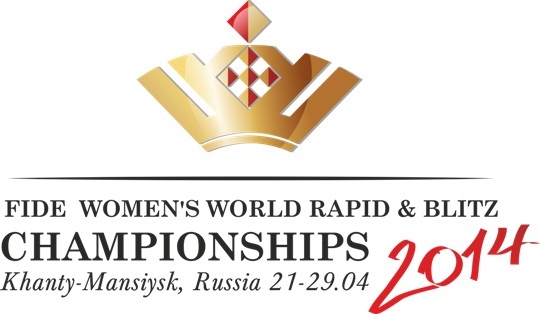 Coming up is FIDE Women World Blitz Championship which is taking place in Khanty-Mansiysk over the next three days.